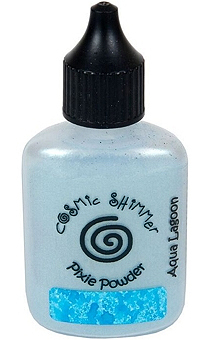 Cosmic Shimmer Pixie Powder is a dry powder waterbased dye and mica mix in bottles that you can "puff" over wet paper, card and other porous surfaces. As the powder hits the wet surface, the dyes and mica spread out creating bursts of colour. Can also be mixed into paints and varnishes to create colourful, shimmering tints. Polymer clayers can mix it into wet varnish and apply over baked polymer clay for example. Comes in a 30 ml bottle with precision nozzle.